NATO runs an annual exercise to train pilots in the use of nuclear weapons at bases in Europe under the title of “Steadfast Noon”. The next one is scheduled to take place from October 15th to 26th in Büchel, a German Bundeswehr base in Rheinland-Pfalz and will involve pilots from five European countries. The nuclear weapons are B61 gravity bombs, supplied by the USA. The aircraft and pilots are supplied by European NATO members: namely Belgium, Germany, Italy, the Netherlands and Turkey. The issue of “nuclear sharing” – the NATO practice of storing US nuclear bombs at air force bases in Europe belonging to other members, training and planning for the delivery of those weapons to targets using airplanes flown by non-US personnel – is controversial. Many countries hold the practice to be a violation of the Non-Proliferation Treaty which expressly forbids nuclear weapon states from passing on nuclear weapons to non-nuclear weapon states. In the past two to three years, the existence of these weapons – about 180 altogether, 10-20 in each country in Belgium, Germany and Holland, 70-90 in Italy and possibly 50 in Turkey – has been the subject of debate in NATO. The populations in most of the “host” countries are opposed to the deployment of nuclear weapons and want their removal. However, finding consensus among all the member states of NATO is difficult and the “nuclear sharing” issue remains unsolved. 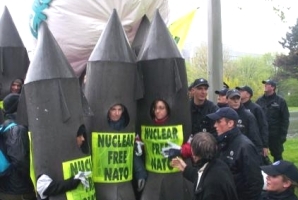 The campaign for the removal of the US nuclear bombs in Germany “nuclearfree.now” calls for the cancellation of the “Steadfast Noon” exercise. Spokesperson for the campaign and nuclear disarmament expert for the International Physicians for the Prevention of Nuclear War, Xanthe Hall, says: “The training of German and other European pilots in the use of nuclear weapons contravenes international law, as defined in the 1996 advisory opinion of the International Court of Justice which states that the use and the threat of use is generally illegal.” The ICJ opinion was unable to rule on the legality of nuclear weapons’ use in a scenario where the very existence of the state was threatened. Hall says that this is patently not the case for Europe. The last two “Steadfast Noon” exercises were held at Volkel in Belgium (2011) and Aviano in Italy (2010).